Three Rooms Press, in coordination with Raven Bookstore, KU Bookstore, and KJHK (90.7 FM) present a series of readings and discussions to celebrate the launch of Don’t Hide the Madness: William Burroughs in Conversation with Allen Ginsberg, a new book documenting a five-day conversation between the legendary Beat icons. Events kickoff on Thursday, April 25, 3:00 p.m. with a live interview session at 7 p.m. on KJHK radio (90.7), followed at 7 pm with a reading and panel discussion at Kansas University bookstore (in the Kansas Student Union, 2nd level). Friday, April 26, features an in-store reading and lively discussion at 7 p.m. Raven Bookstore (6 E. 7th Street). 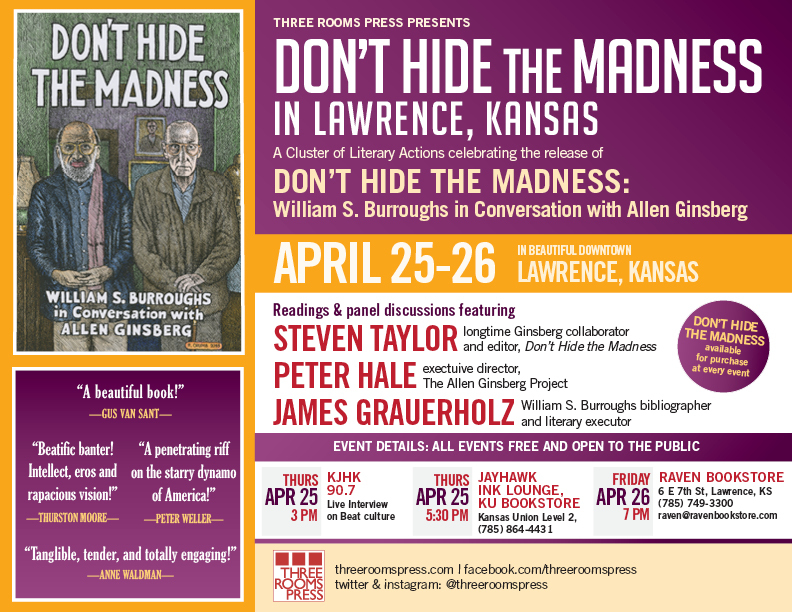 All three events will feature longtime Steven Taylor (Ginsberg collaborator and Don’t Hide the Madness editor), Peter Hale (executor of the Allen Ginsberg Estate), and Lawrence local James Grauerholz (executor of the William Burroughs estate). All events are free and open to the public. Copies of DON’T HIDE THE MADNESS will be available for purchase at all events.